Joc Pederson’s 25th home run of the season achieves a couple milestones. The Dodgers have four hitters with 25 home runs for just the fourth time in franchise history. Joc Pederson‘s two-run home run Wednesday against the San Diego Padres gave the center fielder 25 this season. He joins teammates Justin Turner (27), Yasmani Grandal (27) and Corey Seager (25) in the exclusive club. It’s the first time the Dodgers have had four 25-home run hitters since 1997, when Eric Karros, Raul Mondesi, Mike Piazza and Todd Zeile achieved the milestone. Dusty Baker, Ron Cey, Steve Garvey and Reggie Smith achieved the feat in 1977. Roy Campanella, Carl Furillo, Gil Hodges and Duke Snider did so in 1955. Pederson and Duke Snider are only players in Dodgers history with 2 25-HR seasons before turning 25. If you’ve been to Dodger Stadium, you’ll recognize the setting for “Out Of My League,” a six-episode series on AwesomenessTV. After its premiere on Monday, September 19th, “Out of My League” debuts episodes every Monday through the finale on October 24th, the day before Game One of the World Series. Joc Pederson filmed some scenes for the finale. Check out the trailer above, which includes a peek at Pederson’s cameo. AwesomenessTV can be watched on its dedicated YouTube channel, Netflix, Hulu and more. Dodgers scratch Hyun-Jin Ryu from Wednesday start with elbow tendinitis. 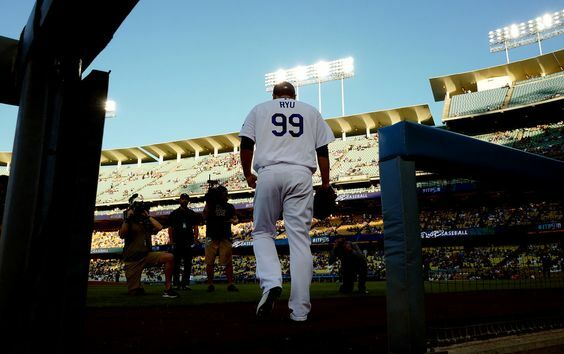 The Dodgers placed Hyun-Jin Ryu on the 15-day disabled list Tuesday with left elbow tendinitis, and suddenly need a pitcher to start Wednesday against the Washington Nationals. The Dodgers also placed reliever Casey Fien on the 15-day DL with tendinitis in his right elbow retroactive to Sunday. Outfielder Joc Pederson, whose rehab assignment at Triple-A Oklahoma City is over, was activated from the disabled list, and left-handed reliever Luis Avilan was recalled from Triple-A. Ryu missed all of 2015, and the first three months of the 2016 regular season, while rehabbing from left shoulder labrum surgery. He returned July 7 against the San Diego Padres and allowed six runs in 4 ⅔ innings, suffering the loss. That remains his only major league start to this point in the season. An MRI on Ryu’s left elbow showed no changes from his previous MRI. Jose De Leon is scheduled to pitch for Oklahoma City on Wednesday. The Triple-A Dodgers are currently in Tacoma, Washington. De Leon, a 23-year-old right-hander, has yet to make his major league debut. Brock Stewart, a 24-year-old right-hander, has made one spot start for the Dodgers already this season and was scheduled to start for Oklahoma City tonight. 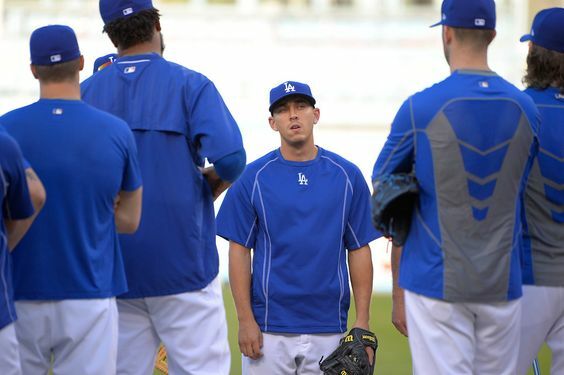 It’s possible the Dodgers could give Stewart an extra day’s rest before his second cup of coffee in the big leagues.